Hi Everyone! 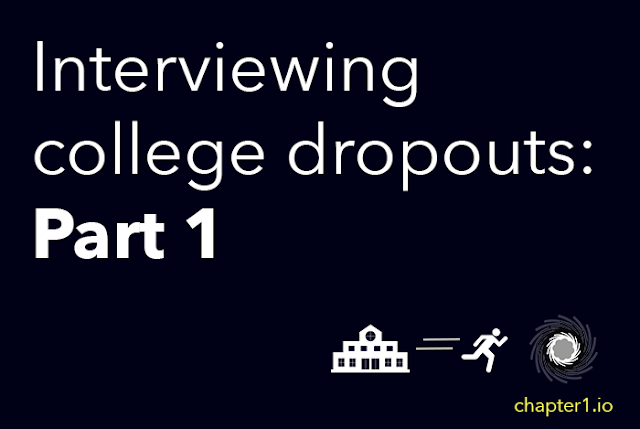 I'm starting a new segment called "The Drop Out Series" where I asked a series of questions to individuals who have dropped out of higher education to pursue their passion full time. The next 8 interviews are people who already answered last year so it's out of date, but I will be interview more as I obtain further interest. These individuals had the opportunity to remain anonymous so if you don't see a name, you'll know why! Please follow me on instagram @chapter1.io or like my page on facebook for the latest updates! Will be setting up a e-mail subscription update system soon. Thank you so much Gabe for interviewing with Chapter1.io! Let's begin. Please give a brief description of yourself (academic background, work experience, fav hobby, etc). Why did you drop out of college? What was the the transition procedure like? Did you have family and friends supporting/understanding your decision? If not, how did you deal with it? My family didn't understand. My friends did. I dealt with it by moving forward, working relentlessly to get a job, and becoming independent. Where are you now? What are you currently doing/working on? I'm currently on a volcanic island in Nicaragua living and working in a yoga eco-village. I got laid off from my job at the startup after seven months as it began to run out of money. My work life started to look more and more like a TV show making fun of startups rather than working at an actual startup, which was rather demotivating. I'm mainly spending my time writing articles now. I'm trying to find some remote freelance development work too because even 10 to 20 hours of work pays for what is essentially one month of luxury in the Nicaraguan jungle. If you could go back in time, what is one thing you would change to better pave way for your future? Who can say? Maybe I would've gotten hit by a bus if I stayed in school one more day. The best we can do in any situation is do what seems best at the moment. They say hindsight is 20/20, but I don't think that's true. Our memories are terribly inaccurate. We don't know how things could've gone if we chose otherwise. And we definitely can't see the future. The only change that's clear to make are the actions we decide on in the only thing we have: The present moment right now. I was against the idea of traditional college years before I attended, but I couldn't seem to convince anyone else of the same. So while I wouldn't change anything, my only regret is not having had the willpower to listen to and trust myself earlier. Are you planning on going back to school? I haven't a clue. Udacity is offering some great coursework in extremely employable skills (self-driving cars, VR/AR, AI, and the like), which are much cheaper than school. Lately I've been developing an interest in abstract mathematics, which I would enjoy as well. But I'm also an autodidact. I'd rather learn these things on my own. And especially with the state of AI, you have to be able to learn it on your own, because the state-of-the-art for staying relevant is always held within the pearls of research papers and the github pages of researchers. What are some advice for others who are planning to drop out or not attend a higher education institute? If you want to be interviewed for your awesome startup, job, project or even have any inquiries about anything, please reach out to me at contact@taehongmin.com. Thank you for reading!